This years first recipe is a summer treat, using loads of fresh summer fruits. The perfect dessert for a dinner party or just a mid week treat. 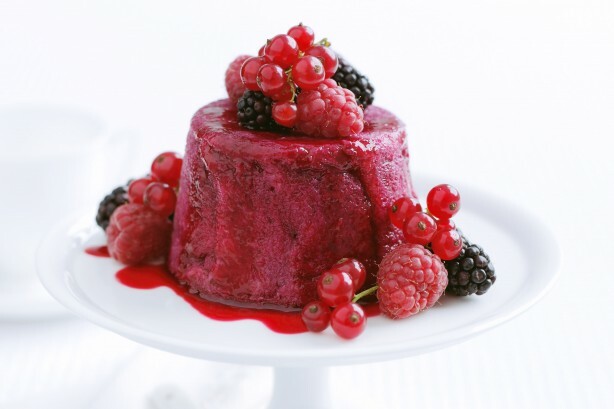 These mini summer fruit puddings are super simple and deadly delicious. Combine the strawberries, raspberries, blueberries, blackberries, redcurrants and sugar in a large saucepan over low heat. Cook, gently stirring occasionally, for 5 minutes or so. Remove from heat and set aside to cool. Strain through a fine sieve to separate the fruit from the berry juices. Use a 7cm round pastry cutter to cut six discs from the brioche. Use a 10cm round pastry cutter to cut another six discs from brioche and set aside. Lightly brush a 7cm disc with a little of the berry juice and place the disc, brushed-side down, in the base of a 1 cup capacity dariole mould. Cut the remaining brioche slices into 3cm-wide strips. Brush a strip lightly with berry juice and place around the sides of the mould. Continue with brioche slices until the side of the mould is covered. Repeat with remaining brioche slices. Spoon the berry mixture evenly among the prepared moulds. Top each mould with a 10cm brioche disc to enclose berry filling. Cover each mould with plastic wrap. Place moulds on a tray and top each mould with a small can to weigh down. Place in the fridge overnight to enhance the flavours. Use a round-bladed knife to gently help turn out each pudding onto serving plates. Pour remaining berry juice over each pudding. Serve with double cream and extra fresh berries.